When life gives you lots of ducks or geese (this happens a lot with snow goose hunters), you should make some sausages out of them. Use the shot-up birds you won’t feel bad about cutting up; save the perfect birds for roasting or other uses. Other than snow geese, Canada geese, spoonies, diver or sea ducks are excellent candidates for sausage. I wouldn’t do this with nice pintails, mallards or wood ducks, though. 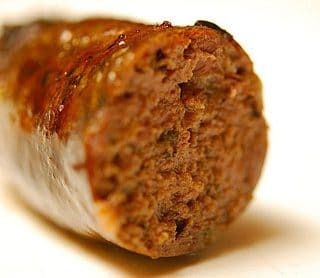 This sausage is “hunter’s style,” which to me means coarse-grained and flavored with traditional European game spices, such as caraway, juniper and sage. This duck sausage has all three, with sage as its main herb. Juniper and caraway can sometimes be hard to find, although every major supermarket I’ve every been to has at least caraway. Juniper can be tougher to source, but if you live in the West there are a lot of wild species of juniper; the best is Juniperus communis. In the East, look for the blue berries on Eastern Red Cedar, Juniperus virginiana. You can buy juniper in fancy supermarkets, in places like Cost Plus World Market, and online through places like Penzey’s. These sausages would be perfect with a cassoulet, with beans, or simply pan-roasted or grilled and served on a roll with some mustard and sauerkraut or onions. The possibilities are unlimited. Note that the only ingredient measured in grams is the salt -- it is that important to get the saltiness right. I did include a rougher measurement to get you close, if you don't have a scale. I like to use a dark, malty beer here, but red wine or even gin is a good alternative. A German dunkelweiss is my beer of choice, followed by a porter or Scottish ale. If you are averse to alcohol, use ice water. Get out about 15 feet of hog casings and soak them in warm water. If you don’t trust your source, run water through them to check for punctures or weak spots. Make sure all your equipment is cold; freeze your grinder’s grinding plate and blades, and the bowl you will put the meat into for 30 minutes to an hour. Do the same for the meat and fat. When everything’s nice and cold, mix the meat and fat with the salt and all the dry spices. Once the sausage has been ground twice, test the temperature again to make sure it’s cold. I prefer to chill the mix down to 28°F to 32°F for this next stage. Chill the mix and when it’s cold enough, take it out and add the beer and water. Now, mix and knead the mixture in a big bin or bowl with your hands for a solid 2 minutes — your hands will ache with cold, which is good. You want everything to almost emulsify. Stuff the sausage into the casings rather loosely into a continuous coil. When you're done, it's time to make links. I like my sausages to be about 6 to 8 inches long, but it’s your choice. To twist them into links, tie off one end of the coil you just made. Pinch off links with your two hands and roll the link between them forward a couple times. Move down the coil and repeat, only this time roll backwards a few times. Repeat until you do the whole coil. Now look at the links, which will probably have air pockets in them. Use a sterile needle or sausage pricker (set it aglow in your stovetop flame) to puncture the casing over all the air pockets. Gently compress the links together to squeeze out the air pockets and rotate the links a bit more to tighten; this takes practice. Hang your links for at least 1 hour if your room is warm, and up to overnight if you can hang them in a place that’s 40°F or cooler. Don’t let them freeze yet. If you are not hanging overnight, let the sausages continue to dry uncovered in the fridge overnight before you seal them up and freeze. These sausages will keep a week in the fridge and a year in the freezer, if you have vacuum-sealed them. One way to get a tighter bind on the sausage is cut the meat and fat into chunks that will fit into your grinder, toss them with the salt, then do the first grind. Now let this rest in your fridge overnight. 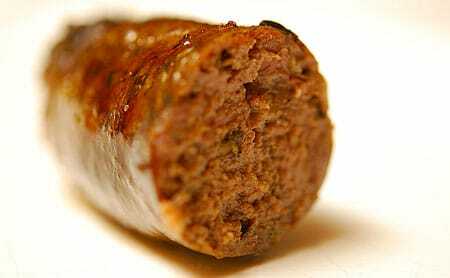 This helps develop myosin, which binds the sausage together. I always do this step, but it's not strictly necessary. 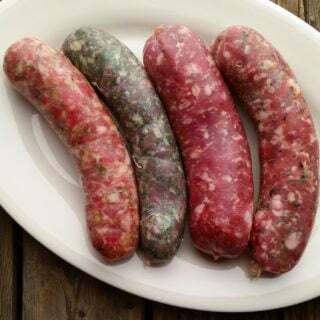 You can find other recipes for fresh or smoked sausages, using duck, goose and all sorts of other meats, right here on Hunter Angler Gardener Cook. Hi, can i use my cull ducks? I have tons of cull mallards in our farm.. thanks.